This is the last part of a 2 part tutorial. Part 1 covers basic proportions of a hand. If you have not reviewed it, please click here. Being able to draw the shape of a hand is great, but what happens after that? In this tutorial, I will be covering how to draw nails, skin, wrinkles and folds for several different types of hands: baby, elderly, masculine and feminine. What characteristics make a hand look strong, gentle or young? Read more to find out! Elderly people generally have less body fat, so when you draw the outline, make sure to pronounce the joints. mechanical pencil to create layers of circles with even amounts of pressure. Avoid shading the nails. Switch to a 2B or even 4B to darken areas between bones or around tendons to make the hand appear even skinnier. Layer the circles on until the gaps are really small, but still visible to achieve the look of fine lines. In order to retain as much realistic skin texture as possible, do not blend or smudge! If you feel the need to blend any area of the drawing, use an HB pencil to layer on even more circles. I will go into more details in a future tutorial on skin. Follow me on Facebook to get an update whenever I post a new article! Click here to learn how to shade! Use a blunt 2B pencil to draw clean lines where prominent folds, wrinkles and veins appear. Then apply different shading techniques for each one. Give some of the wrinkles at each finger joint some wider valleys than others. To make them easy to draw you can section each nail into 3 main areas: the lunule (the white semi circle above the cuticle), body of the nail and the free edge. If you look at your fingernail up close you will notice many lines stretching across the entire nail. Because of these lines, there will be breaks in the light reflected off the nail’s surface. Draw lines to section off areas you need to shade or highlight. As we age, our nails grow thicker and the lines may become more apparent. Shade these areas in one at a time. Make sure to give the nail some shape by making the left and right side darker. In order to draw strong masculine hands, we need to go back to part 1 and enlarge the bottom row of joints for each of the four fingers. For the thumb, enlarge the two bottom joints. If you look at your dominant hand, you may notice that the bottom two thumb joints are more prominent compared to your other hand. These joints change over time, especially for those who are frequently involved in laborious physical work. With a blunt HB pencil, use circular motions to draw the skin, but this time follow up with a blending stump to smooth out the texture. Introduce lots of lines and shapes for a chiseled look. Accentuate tendons and veins. You can find an interactive diagram with tendons and veins here. The only apparent wrinkles are located at each finger joint. Keep the lines narrow and shallow. Draw short fingernails with lots of texture for a rugged look. Put less emphasis on the finger joints and knuckles. Especially the bottom 2 thumb joints. Use a blunt HB pencil to draw the skin using circular motions and then blend using tissue paper. Unlike masculine hands, avoid harsh lines and shapes. Make the skin as smooth and consistent as possible. Tendons should only be slightly visible with very gradual shading. Most people think fingernails grow out straight, when really they’re curved. In fact, the longer they grow, the more apparent this curve becomes. Have you ever watched the episode of Guinness World Records featuring the lady who grew her nails 10 feet long? They literally spiral out of control! Fake nails or real… there will almost always be a curve. Don’t overlook this detail! Add thickness between each joint and round out the tips of each finger so they are nice and plump. If you are drawing a skinny baby hand, do not put too much emphasis on the bottom 2 thumb joints. Baby hands are smooth and plump, so you want to focus on making your circles as close together as possible. Keep your pencil pressure consistent and work in layers using only a blunt HB pencil until you are ready to do some darker shading. Avoid using any lead softer than 2B. Stick to gradual shadows for a cute chubby hand. Use tissue paper to smooth out the skin. 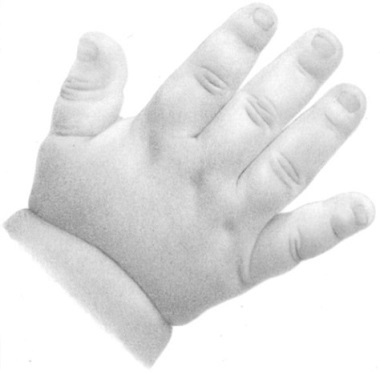 One big characteristic of babies or children’s hands are the dimples that appear on each knuckle (minus that of the thumb) when the fingers are outstretched. Use a 2B pencil to draw these cute little dimples, making sure to appropriately shade and highlight the space around it. Babies have very few wrinkles, so when drawing finger joints, draw only a few large wrinkles. They should appear thick, so stick to gradual shading with less prominent highlights. A healthy baby has smooth, shiny nails. Avoid adding any additional textures. I hope you enjoyed this tutorial on how to draw hands: beyond structure. If you have any questions or comments, please drop them in the comments section below! I really appreciate these tutorials! Thanks so much. Please do a tutotrial on full body figure. Are there any steps on how to shade in various hands? That’s what I’m trying to do in my art class today! Hi Sean, I’m not quite sure what you mean, sorry. I think he means that he wants to know how the shading inside of details like wrinkles or scars would be done. I am a 74 year old Heinz 57 Canadian artist (ha! wannabe, maybe. Couldn’t find how to make a one time donation and couldn’t. Please advise. I like your sense of humor :) To donate, you can become a patron of mine here and cancel after the first month or alternatively purchase one of my exclusive tutorials. I really appreciate your support, Robert! Thank you very much! Gracias por tus tuturiales, son exelentes y de mucha ayuda. have been following your website for a while and really appreciate the amount of quality you put into these tutorials. it really helps me!! I just want to say thank you and keep doing what you are doing it’s great!!!! It’s on my to-do list but I won’t be able to start it until after the holiday. Thx for an great lesson! The elderly hands technique, it was awesome. I have been practicing drawing hands for the last month and they’ve never came out right, texture wrong. I used a .3mm mechanical pencil and drew the small circles, I have texture and realism. I am awed by this. Thank you. Thank you.